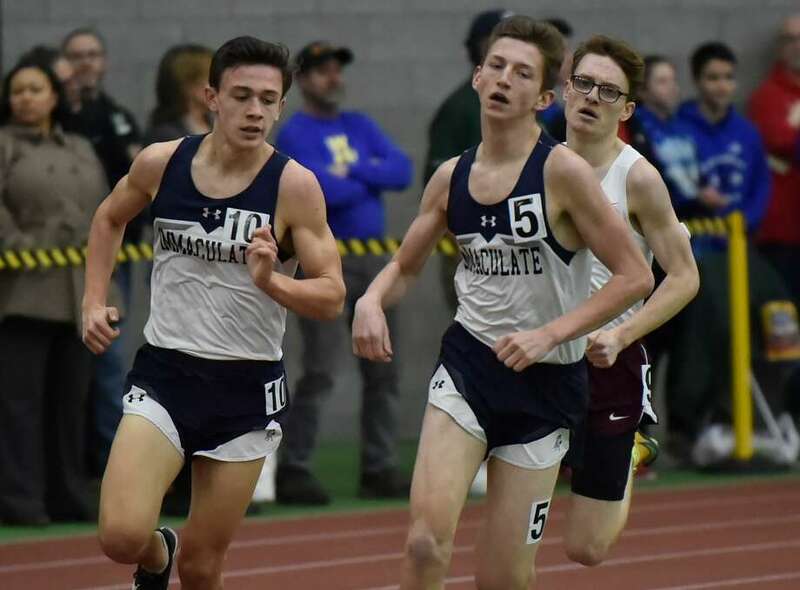 NEW HAVEN — While Old Saybrook had its share of success in the CIAC Class S boys and girls track and field championships at Floyd Little Athletic Center on Friday, in the end Bloomfield’s depth proved to be too much to overcome in both meets. Kymali Hay won the 55 in 6.52 seconds and Sean Dixon-Bode won the long jump (22 feet, .25 inches) to lead Bloomfield to the boys Class S title with 115 points. Terry Miller won the 55 (7.03 seconds, tied meet record) and 300 (39.91) and Jillian Mars won the 600 (1:39.51) to lead Bloomfield to the girls Class S title with 97 points. For the Bloomfield girls it is their 10th straight Class S title. Old Saybrook finished second with 58.25 points and Immaculate was third with 42. Rounding out the top three teams for the boys, Old Saybrook was second with 48 points and Northwest Catholic was third with 39. Twins Grace Hanratty and Luke Hanratty of Old Saybrook led the Rams in their respective meets. Grace Hanratty won the girls 1000 in 2:58.03. Luke Hanratty ran a leg to help the Rams win the boys 4×800 relay and he was third in the 600 in 1:27.48. “My coach Jan Merrill told me before I ran to just run my own race,” Grace Hanratty said. “I used my speed and took it out hard and then I kicked hard at the end. In the boys meet, Old Saybrook had a first and third in the 600. Luke Hanratty came in third but teammate Cooper Luciani pulled away the last 200 meters to win in 1:26.95. Derby standout Ja’Kwan Hale, who always seems to have a smile on his face, was smiling after competing in the high jump and 300. He won the high jump with a height of 6-6 and he won the 300 in 35.54. “I wasn’t really satisfied and I’m a little disappointed with my 6-6 in the high jump, I was hoping for 6-9,” Hale said. “But coming away with two wins in a state meet, I’m happy with that, real happy. Kyle Gabinelli of Seymour won the long jump (18-8) and Hayden Rovelli of Coginchaug won the pole vault (14-0). In the girls meet, other top winners included Cate Coppes of Old Saybrook who won the pole vault (11-0) and Patricia Jurkowski of Seymour won the 55 hurdles in 8.86. Olivia Lombardi of Oxford was happy with her win in the high jump with her final height of 5 feet. The 1600 was the event of the night for the Immaculate girls team, which swept the top three spots. Taylor Mascetta won in 5:13.07, Molly Coyle was second in 5:18.12 and Ailene Doherty was third in 5:19.09. 55 Meter Dash Finals: 1. Kymali Hay, Bloomfield, 6.52; 2. Keith Berrouet,Smsa, 6.58; 3. Jaylon Nealy, Bloomfield, 6.59; 4. Jaelyn Butler, TrinityAcademy, 6.63; 5. Nick Braga, Valley Regional, 6.69; 6. Andrew Fergusen, Valley Regional, 6.73. 300 Meter Dash: 1. Ja’kwan Hale, Derby, 35.54; 2. Kymali Hay, Bloomfield,36.23; 3. Shakur Hill, Bloomfield, 36.31; 4. Andrew Fergusen, Valley Regional, 36.43; 5. Khalil Easton, Plainfield, 36.68; 6. Keith Berrouet, Smsa, 36.75. 600 Meter Run: 1. Cooper Luciani, Old Saybrook, 1:26.95; 2. EllisPhillips-Gallucci, Windham, 1:27.30; 3. Luke Hanratty, Old Saybrook, 1:27.48; 4. Jahmar Lindo, Bloomfield, 1:28.88; 5. Max Temple, Coginchaug, 1:29.09; 6. Eric Wilson Jr., East Catholic, 1:29.30. 1000 Meter Run: 1. Michael Stamm, Northwest Catholic, 2:38.44; 2. JacobIreland, East Hampton, 2:39.15; 3. Matt Jennings, Haddam-Killingworth, 2:41.95; 4. Jonathan Kittredge, Windsor Locks, 2:45.25; 5. Joshua Fee, Classical Magnet, 2:46.34; 6. Matthew Speight, Plainfield, 2:46.35. 1600 Meter Run: 1. Victor Cazabal, Windham, 4:36.06; 2. Eddie Nicholas,Nonnewaug, 4:37.22; 3. Heath Olivieri, East Catholic, 4:39.51; 4. James Sullivan, Immaculate, 4:42.66; 5. Anthony Corso, Innovation, 4:43.78; 6. Alexandre’ McMillian, East Hampton, 4:47.49. 3200 Meter Run: 1. Eddie Nicholas, Nonnewaug, 9:53.09; 2. Chris Deforest,Terryville, 9:54.72; 3. Victor Cazabal, Windham, 10:08.35; 4. Mark Rodriguez, Cromwell, 10:17.55; 5. Michael Stamm, Northwest Catholic, 10:18.22; 6. Ryan McNerney, Immaculate, 10:25.15. 55 Meter Hurdles: 1. Edward Williams, Sacred Heart, 7.51; 2. LorenzoGarcia, Northwest Catholic, 7.99; 3. Enrique Lopez Garcia, Windham, 8.01; 4. Jonathan Rodriguez, Innovation, 8.14; 5. Raphael Mena, Smsa, 8.25; 6. Cameron Brown, Shepaug Valley, 8.29. 4×200 Meter Relay: 1. Bloomfield (Dante Montaque, Sean Dixon-Bode, AnthonySimpson, Shakur Hill), 1:33.98; 2. Northwest Catholic (Paris Carpenter, Justin Tavares, Samuel Deveau, Brandon Drummond), 1:35.64; 3. Old Saybrook (Jack Colella, Carlos Chacon, Devon Moshier, Max Thomas), 1:36.14; 4. East Catholic (Brendan Truman, Logan Reynolds, Joshua Duvall, Eric Wilson Jr.), 1:36.82; 5. Coventry (Jack Poland, Jacob Krause, Nikolaj Freschlin, Chase Prentiss), 1:36.88; 6. Coginchaug (Colin Sheehy, Connor Rulnick, Tim Arcari, Ryan Genest), 1:37.13. 4×400 Meter Relay: 1. Bloomfield (Jaylon Nealy, Shakur Hill, Jahmar Lindo,Kymali Hay), 3:29.72; 2. Coginchaug (Connor Rulnick, Anthony Gavrilovic, Ryan Genest, Tim Arcari), 3:35.90; 3. Old Saybrook (Luke Hanratty, Cooper Luciani, Max Thomas, Jack Colella), 3:36.38; 4. East Catholic (Logan Reynolds, John Oei, Heath Olivieri, Eric Wilson Jr.), 3:38.79; 5. Innovation (Malachi Bolden, Jonathan Rodriguez, Brennan Kievman, Quentin Askew), 3:42.80; 6. Woodland (Edit Krivca, Michael Falcone, Conrad Filippone, Ryan Swanson), 3:43.17. 4×800 Meter Relay: 1. Old Saybrook (Luke Hanratty, Shon Ryan, JacobSchneider, Cooper Luciani), 8:22.90; 2. East Hampton (Alexandre’ McMillian, Tomas Lopes, Jonathan Barber, Jacob Ireland), 8:27.55; 3. Haddam-Killingworth (Christian Uzwiak, Max Cozean, Seth Freeman, Matt Jennings), 8:36.84; 4. Immaculate (Parker McKenzie, Allen De Dios Reigo, Ryan McNerney, James Sullivan), 8:48.45; 5. Coginchaug (Nicholas Vestergaard, Max Temple, Aidan Garcia, Brendan Dana), 8:59.07; 6. Northwest Catholic (Matthew Poniatowski, Matthew Deneen, Aidan Deneen, Declan Wlochowski), 9:01.16. 1600 Sprint Medley: 1. Northwest Catholic (Brandon Drummond, Samuel Deveau,Justin Tavares, Michael Stamm), 3:44.94; 2. East Hampton (Daniel Kostoss, Jack Piper, Jonathan Barber, Jacob Ireland), 3:46.88; 3. Bloomfield (Ajrael Anderson, Korey Steele, Sephton Reid, Tyler Wesley), 3:50.44; 4. Classical Magnet (Tajh Ferguson, Dorian Bernard, Stephen Babolola, Joshua Fee), 3:51.36; 5. Old Saybrook (Devon Moshier, Carlos Chacon, Max Thomas, Shon Ryan), 3:52.58; 6. Morgan (Bryce Thomas, Michael Savage, Calvin Jackson, Chayse Lofgren), 3:54.06. High Jump: 1. Ja’kwan Hale, Derby, 6-06; 2. Chaddane Williams, Bloomfield,6-04; 3. Peter Fuller, Canton, 6-02; 4. Spencer Brown, Immaculate, 6-00; 5.Stephen Mallard, Classical Magnet, 5-10; 6. Eli Manning, Oxford, J5-10. Pole Vault: 1. Hayden Rovelli, Coginchaug, 14-00; 2. Cody DeAngelo, OldSaybrook, 13-00; 3. Tyler Knapp, Haddam-Killingworth, 11-06; 4. Michael Gingras, Westbrook, J11-06; 5. Connor Zolnik, Coginchaug, J11-06; 6. Samuel Wolf, Oxford, 10-00; 6. Brendan Owen, East Hampton, 10-00. Long Jump: 1. Sean Dixon-Bode, Bloomfield, 22-00.25; 2. Anthony Simpson,Bloomfield, 21-10.75; 3. Ajrael Anderson, Bloomfield, 21-08.25; 4. Korey Steele, Bloomfield, 21-07.25; 5. Spencer Brown, Immaculate, 21-02.75; 6. Jahmar Lindo, Bloomfield, 20-10.50. Shot Put: 1. Aaron Williams, Bloomfield, 53-11.75; 2. Natanael BarbosaTorres, Windham, 53-08.50; 3. Nicholas Campbell, Bloomfield, 52-00; 4. Tyrone Mack, Montville, 48-08; 5. Michael Campbell, Bloomfield, 47-00; 6. Tyler Oney, Capital Prep, 46-01.75. 55 Meter Dash Finals: 1. Terry Miller, Bloomfield, 7.03#; 2. ChelseaMitchell, Canton, 7.27; 3. Andraya Yearwood, Cromwell, 7.33; 4. Brianna Westberry, Capital Prep, 7.48; 5. D’Jior Delisser, Bloomfield, 7.51; 6. Patricia Jurkowski, Seymour, 7.53. 300 Meter Dash: 1. Terry Miller, Bloomfield, 39.91; 2. Jillian Mars,Bloomfield, 39.93; 3. Kate Carleson, Plainfield, 42.30; 4. Shante Brown, Bloomfield, 42.55; 5. Mali Wilson, Metropolitan LC, 43.61; 6. A’Jah Canty, Metropolitan LC, 43.80. 600 Meter Run: 1. Jillian Mars, Bloomfield, 1:39.51; 2. Jadyn Gibson,Bloomfield, 1:45.12; 3. Marisa Shiland, Abbott Tech, 1:46.39; 4. Jade Brennan, Woodland, 1:46.88; 5. Maeve Balavender, Canton, 1:48.14; 6. Alexis Delucia, Montville, 1:51.42. 1000 Meter Run: 1. Grace Hanratty, Old Saybrook, 2:58.03; 2. CassandraCarleson, Plainfield, 3:02.99; 3. Jessica Stratton, Old Saybrook, 3:08.14; 4. Jaden Young, Woodland, 3:09.87; 5. Jenna French, Sacred Heart, 3:16.64; 6. Elizabeth Bowman, Montville, 3:17.69. 1600 Meter Run: 1. Taylor Mascetta, Immaculate, 5:13.07; 2. Molly Coyle,Immaculate, 5:18.12; 3. Ailene Doherty, Immaculate, 5:19.09; 4. Emma Slavin, Woodland, 5:25.37; 5. Liv DiStefano, East Hampton, 5:26.48; 6. Cassidy Ngaopraseutsack, Derby, 5:26.55. 3200 Meter Run: 1. Emily Sienna, Hale Ray, 11:09.85; 2. Kylie Raymond,Somers, 11:28.47; 3. Katelyn Segreti, Immaculate, 11:36.84; 4. Julia Caputo, Canton, 11:47.05; 5. Natalie Dudas, Immaculate, 12:08.87; 6. Caitlin Wiley, Old Saybrook, 12:15.57. 55 Meter Hurdles: 1. Patricia Jurkowski, Seymour, 8.86; 2. Sophie Kisner,East Catholic, 9.11; 3. Madeline Archangelo, Canton, 9.19; 4. Lauren Ross, Montville, 9.29; 5. Cate Coppes, Old Saybrook, 9.37; 6. Elicia Colon, Bloomfield, 9.66. 4×200 Meter Relay: 1. Bloomfield (Jahmiha Lindo, Shante Brown, EliciaColon, Jahlia Banton), 1:48.93; 2. Plainfield (Isabella Newbury, Emily Moran, Cassandra Carleson, Kate Carleson), 1:52.05; 3. Cromwell (Andraya Yearwood, Melissa Woodcock, Kaitlin Lewkowicz, Jordan Pare), 1:52.39; 4. Griswold (Kamryn Gurnee-Mims, Sarah Merchant, Ava Poore, Audrey Strmiska), 1:52.74; 5. Morgan (Alyssa LeMay, Jessica Flanagan, Carley Schmidt, Madison Corgan), 1:53.39; 6. Metropolitan LC (Jaida Long, Mali Wilson, Rachel Gordon-Robinson, A’Jah Canty), 1:53.69. 4×400 Meter Relay: 1. Bloomfield (Shante Brown, Terry Miller, JahliaBanton, Jillian Mars), 4:04.73#; 2. Plainfield (Isabella Newbury, Emily Moran, Cassandra Carleson, Kate Carleson), 4:09.54; 3. Montville (Katelin Price, Michaela MacCracken, Alexandria Peck, Mady Whittaker), 4:14.16; 4. Cromwell (Taylor Santos, Caitlin DellaRatta, Jordan Pare, Cara Jordan), 4:18.69; 5. East Catholic (Rebecca Villanueva, Fiona Crowley, Laurel Woods, Sophie Kisner), 4:26.37; 6. Old Saybrook (Grace Hanratty, Jessica Stratton, Anna Brodeur, Allison Cody), 4:28.07. 4×800 Meter Relay: 1. Immaculate (Kayla Ondy, Ailene Doherty, Molly Coyle,Taylor Mascetta), 9:37.28; 2. Old Saybrook (Allison Cody, Caitlin Wiley, Tehra Givehand, Emily Stratton), 10:13.18; 3. St. Bernard (Sophia Duhig, Lillian Turner, Serena Britner, Brigid Kunka), 10:30.62; 4. Thomaston (Abby Blasko, Kiersten Sundell, Maegan Desmarais, Briana Grecco), 10:38.23; 5. Haddam-Killingworth (Lauren D’Amico, Julia Callis, Hailey Cassidy, Brianna Minervino), 10:40.14; 6. Canton (Emma Gallant, Julia Caputo, Maeve Balavender, Helena Winkler), 10:45.26. 1600 Sprint Medley: 1. Cromwell (Andraya Yearwood, Jordan Pare, CaitlinDellaRatta, Cara Jordan), 4:20.13; 2. Old Saybrook (Dylan Adams, Autumn Szucs, Allison Cody, Jessica Stratton), 4:23.18; 3. Montville (Katelin Price, Michaela MacCracken, Alexandria Peck, Mady Whittaker), 4:25.68; 4. Sacred Heart (Asia Chapman, Veronique Recile, Beverly Okoronkwo, Jenna French), 4:33.91; 5. Bloomfield (Santorini Mooving, D’Jior Delisser, Jahlia Banton, Alicia Whyte), 4:35.10; 6. Canton (Kaylia Bailey, Maya Sutton-Hall, Brooke Shepard, Helena Winkler), 4:41.65. High Jump: 1. Olivia Lombardi, Oxford, 5-00; 2. Rachel Vigorita, OldSaybrook, 4-10; 3. Lauren Ross, Montville, 4-08; 3. Madeline Archangelo, Canton, 4-08; 3. Nicole DiBenedetto, East Catholic, 4-08; 6. Anna Brodeur, Old Saybrook, J4-08; 6. Madelyn Costello, Valley Regional, J4-08; 6. Faith Rousseau, Seymour, J4-08; 6. Emma Rousseau, Seymour, J4-08. Pole Vault: 1. Cate Coppes, Old Saybrook, 11-00; 2. Carolyn Cumello,Coginchaug, 9-06; 3. Coralin McDaniel, East Hampton, 9-00; 4. Hannah Sumby,Old Saybrook, 7-06; 5. Alicia Whyte, Bloomfield, J7-06; 6. Evelyn Brooke, Granby Memorial, J7-06. Long Jump: 1. Chelsea Mitchell, Canton, 17-08.50; 2. Lauren Roy, GranbyMemorial, 16-07; 3. Mackenzie Glenn, North Branford, 16-04.75; 4. Shenequa Campbell, Bloomfield, 15-07.50; 5. Melissa Woodcock, Cromwell, 15-06; 6. Lauren Ross, Montville, 15-04.25. Shot Put: 1. Alliyah Boothe, Bloomfield, 43-11#; 2. Payge Boyd, ClassicalMagnet, 38-05.50; 3. Otisha Williams, Bloomfield, 35-11.50; 4. Jasmine Michie, Woodland, 35-06.50; 5. Tristian Haugabook, Granby Memorial, 32-07.25; 6. Faith Rousseau, Seymour, 31-06.50.